View cart “Elephant Charge” has been added to your cart. 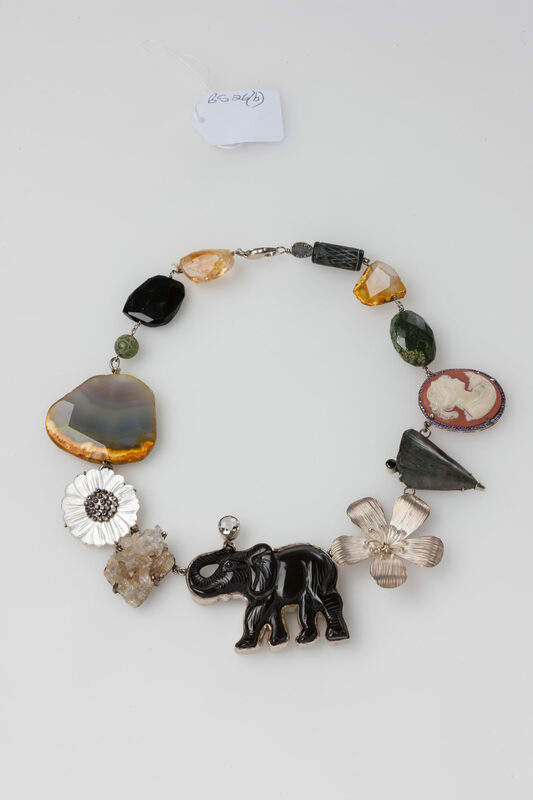 A carved black onyx elephant supports a faceted quartz stone with his trunk. Beside him are rough, uncut quartz, a silver wildflower, a carved shell set with faceted iolites, two rough agate slices (yellow/grey), a prehistoric shark’s tooth set with a black spinel, resin cameo, faceted olive vasonite bead, black tribal, carved jade, green jade bead, black onyx and citrine stones set in sterling silver. 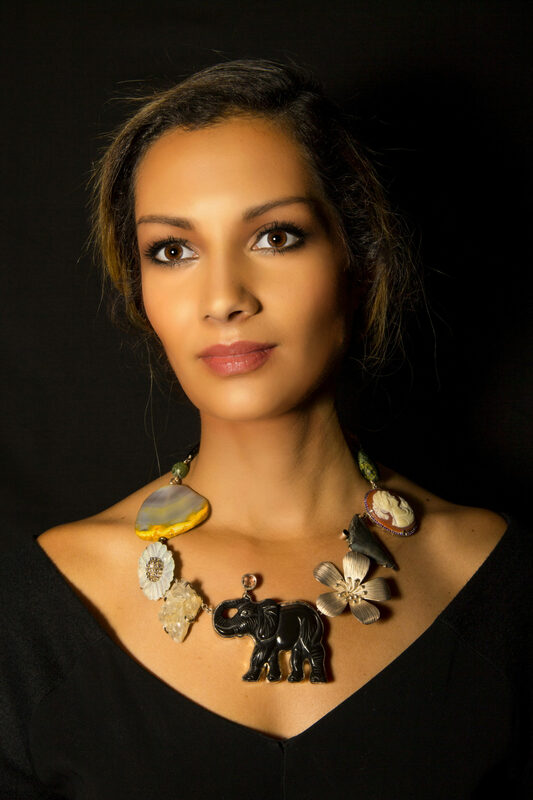 Jane Magon’s inspiration for this necklace came from the memory of a holiday in Ngala, South Africa, in 2012. Whilst sight-seeing in an open vehicle with a ranger and tracker and six other tourists they were confronted by a charging Elephant! Jane describes it as one of the most terrifying experiences she ever enjoyed! In late 2012 my husband and I enjoyed a wonderful holiday in South Africa at Ngala (near Kruger National Park). Late in the afternoon of the 11th November (with our ranger and tracker and six other tourists) in an open vehicle, we rounded a corner of a dirt road. Immediately we saw a very large, lone, fifty-year-old elephant. We pulled up on the road (at a sensible distance) to observe him. He emitted the pungent smell of an elephant ‘in musth’ – a natural chemically driven ‘craziness’ that is the cause of elephants dangerously running amok. ‘Musth’ is easily detectable by the strong smell and a liquid that runs from down the side of the face. Our guide decided to drive around him. I thought this was risky. I felt we were too close. Suddenly he saw us. His trunk ‘knotted’ and I knew instinctively he was going to charge us in the open vehicle. The full story of the Elephant Charge will be the sole privilege of the owner of this piece. all worked onto sterling silver. LENGTH: 57cm or 22 1/2 inches.